It is just the extended version of Tapa Snake. There is a change in only one rule. The below puzzle is very easy one just to show the usage of rules. This puzzle does not use much of it but of course clearly depicts the meaning of rules. 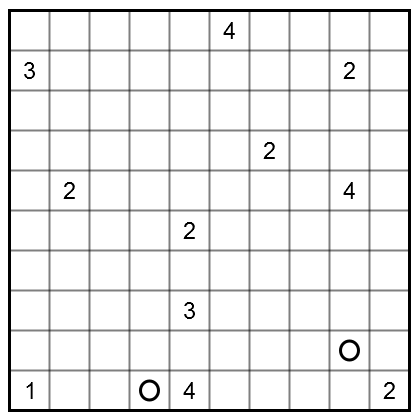 1) Locate a snake in the grid, moving horizontally or vertically without touching itself even diagonally (i.e. not even at a point). 3) The Head and Tail of snake are given as black circles. I like this one's possibilities more. Finished it round about the same time as the last one, but was a bit more fun with the non-restrictive clues. I wouldn't call it a Tapa variant though, since the clues do not behave like Tapa clues, and the snake doesn't behave like a Tapa wall either.